When you hear "Keep Portland weird," it's a proud declaration of everything that makes this Pacific Northwest city unique, as well as a battle cry to maintain it. An art tax is levied on all residents to provide consistent funding for public art works and programs. Another feature that sets Portland apart is the city's Urban Growth Boundary -- a law put forth in the '70s to prevent urban sprawl and keep the city confined to set parameters. This not only means that the wilderness of the Columbia River Gorge is at the doorstep of most Oregon visitors, but that farm-fresh products literally go from farm to table in hours flat, resulting in a spectacular and surprising culinary scene. All this means that cruisers departing from Portland, Oregon on Columbia and Snake River trips benefit from some of the country's best dining, outdoor recreation and hospitality. Did we mention there's also no sales tax? 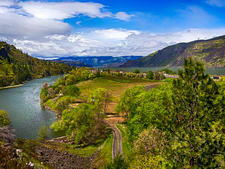 American Cruise Lines, American Queen Steamboat Company, UnCruise Adventures and Lindblad Expeditions all use Portland as a starting point for scenic cruising along the Snake River and through the Columbia Gorge. Less of an outdoorsy type and more of a history-lover? 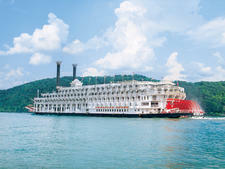 This cruise trails the famous journey of early explorers Lewis and Clark. Despite the adventurous nature of the itinerary, U.S. residents won't even need a passport; the sailing dips into Washington, but primarily remains along the shores of Oregon. All four cruise lines are considered small, with ships accommodating from 62 to 150 people. ACL and American Queen are U.S.-based river cruise companies, while UnCruise and Lindblad dominate the space of expedition cruising. When sailing from Portland, both UnCruise and Lindblad depart from Tom McCall Waterfront Park, along the Willamette River; 25 minutes from the airport (consistently rated the country's best) and a 10-minute walk from some of the city's finest hotels, located in a shopping district known as The Pearl. American Cruise Lines' ships depart from the Red Lion Hotel on the River, a 15-minute drive north to Hayden Island near the border of Washington, and directly along the Columbia River. American Queen Steamboat Company ships depart from the port in Vancouver, Washington, a 15-minute ride north of Portland, across the Columbia River. If you're staying nearby Tom McCall Park, you'll be minutes from most of Portland's top attractions. Mills End Park -- the world's smallest park, located in a median -- is along the waterfront and true to quirky Portland form, was dedicated in 1948 as the only colony for leprechauns west of Ireland. Pioneer Courthouse Square, affectionately called Portland's living room, is a 15-minute walk from the waterfront park, and drops you in the center of shops, hotels, museums and the first Starbucks location outside of Washington (where the brand began). Each one of the tens of thousands of bricks that line the square was funded by individuals -- most in the community -- and many bear the names of fantastical benefactors like David Bowie and God. Even when the destination you seek is not within walking distance, Portland has an incredible and affordable public transportation system called the TriMet (bus, light rail and commuter rail), as well as a bevy of rentable bikes known as Biketown PDX. The currency in Portland is the U.S. dollar. Multiple ATMS are within a short walking distance of Tom McCall Waterfront Park; try the machine at 225 SW Ash Street -- it's squarely between tourist havens Voodoo Doughnut and Stumptown Coffee Roasters. 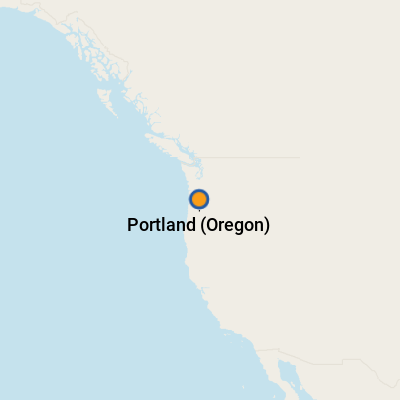 Portland is part of the United States; English is spoken. Drinking is a serious business in PDX. Sure, craft beer is a hallmark of the Pacific Northwest, and cocktail mixology has never been fresher, but we're not just talking about happy hour; coffee and tea in Stumptown are elevated to a new level with baristas wielding chemistry degrees and some of the finest tea services outside of London. Prefer a glass of vino? The nearby Willamette Valley in Oregon is considered comparable to France's renowned Burgundy or Alsace growing regions by international wine experts -- so a glass of what's local means you'll be getting top quality. For beer, you're safe trying just about anything, but might recognize the Rogue brand, based in Oregon. For cocktails, pretend you're taking a cruise to the tropical islands with not one but two spectacular tiki bars: Hale Pele and Alibi, with Rum Club serving up similar drinks in a more laidback atmosphere. The Portland Wine Bar and Winery Tasting Room is a self-explanatory locale to sample the best of what Oregon's grapes have to offer. To warm up, try a cup of joe at Water Avenue or Case Study. If you have an afternoon, be sure to book a tea service at the Hotel deLuxe for traditional British style (they import the clotted cream) or Headwaters at the Heathman Hotel for a Russian tea, provided in partnership with local tea legend Steve Smith. Third Wave Coffee Tours provide a guided trek through unexpectedly diverse offerings of coffee and tea around the city, depending on what you're looking for.